The South-Eastern Europe (SEE) economy is expected to have recorded its strongest year-on-year expansion in eleven years in 2017 on a combination of healthy global demand and sentiment, ample fiscal stimulus programs and robust foreign capital inflows. GDP growth for the year is estimated to have clocked in at 5.4%, well above the 3.0% rise recorded in the previous year. Regional growth is, however, expected to have peaked in the third quarter, with high-frequency data pointing to a moderation across economies in the fourth quarter. In Turkey, growth is expected to have decelerated markedly in Q4 from the base effect- and stimulus-driven 11.1% year-on-year surge recorded in Q3. The government’s USD 66.4 billion Credit Guarantee Facility (CGF), which provided a strong but short-lived boost in the first three quarters of the year, was nearly expired by Q4, while a string of political rows between Turkish officials and their European and American counterparts caused the lira to plunge in the same quarter, stoking inflationary pressures and wreaking havoc on the monetary front. Nonetheless, a resilient domestic economy and solid EU demand for Turkish goods and services is expected to have cushioned any severe deceleration in growth. The Turkish economy, however, remains beset by structural imbalances, most worrisome of which is the widening of the 12-month rolling current account deficit, which in November hit a three-year high. The country relies heavily on short-term inflows to finance its deficit, which proved relatively easy last year on a weak dollar and strong investor sentiment towards EM assets. Nonetheless, a severe correction in global sentiment or a faster-than-expected tightening in developed economies could make financing the deficit more challenging this year. Any of these scenarios could put pressure on yields and the Central Bank’s already-low reserves, which in turn would force Bank authorities to increase interest rates sharply to buck a drop in the currency at the possible expense of economic turmoil. Economic growth is also expected to have decelerated in Bulgaria in the last quarter of 2017. Industrial output moderated in the first two months of the quarter, while the unemployment rate inched higher following two consecutive quarter-on-quarter declines. A similar trend was observed in Croatia: The unemployment rate increased throughout the fourth quarter, and industrial production contracted in the last two months of the year, which likely caused year-on-year growth to come in at a slower clip than in the previous quarter. In Romania, growth is also expected to have eased in Q4 from the rapid 8.8% expansion recorded in Q3 as a marked pick-up in inflation eroded households’ purchasing power. On a more positive note, economic data turned bright in the fourth quarter for Greece, with December’s manufacturing PMI hitting its highest level since 2006, and the unemployment rate falling to a multi-year low in October. That said, regional economic momentum seems to have regained some traction early this year. In Turkey, both business and consumer sentiment picked up in January, while the manufacturing PMI rose to its highest figure in seven years in the same month. The Bulgarian economy also started the year on the right foot, with leading indicators for January showing business confidence jumped to its highest level since October 2008; consumer sentiment also regained ground lost in December. Meanwhile, Fitch Ratings upgraded Croatia’s credit rating from BB to BB+ in early January, noting the country’s improved finances. Incoming economic data is similarly upbeat in Romania; however, political noise continued to dominate headlines in the country following Prime Minister Mihai Tudose’s resignation on 15 January amid a power struggle with Liviu Dragnea, leader of the ruling Social Democratic Party (SDP). Economic growth will likely decelerate this year from the outstanding expansion recorded in 2017 on the back of weaker economic activity in Romania and Turkey. Mounting price pressures and fiscal consolidation in Romania will see GDP growth losing some steam this year, while the withdrawal of fiscal stimulus in Turkey will take its toll on domestic demand. Conversely, the Greek economy will accelerate further as the country’s macroeconomic fundamentals continue to improve, which will partially offset decelerations in Romania and Turkey. The economies of Bulgaria and Croatia will also slow this year following a strong 2017, while growth momentum in most of the remaining Balkan countries will strengthen on the back of resilient FDI and remittance inflows, and increased multilateral funding. Regional GDP is forecast to increase 3.6% this year, which is up 0.1 percentage points from last month’s projection. The back-to-back upgrades reflect carry-over effects from a strong performance in 2017 amid resilient domestic demand growth and a supportive external backdrop. 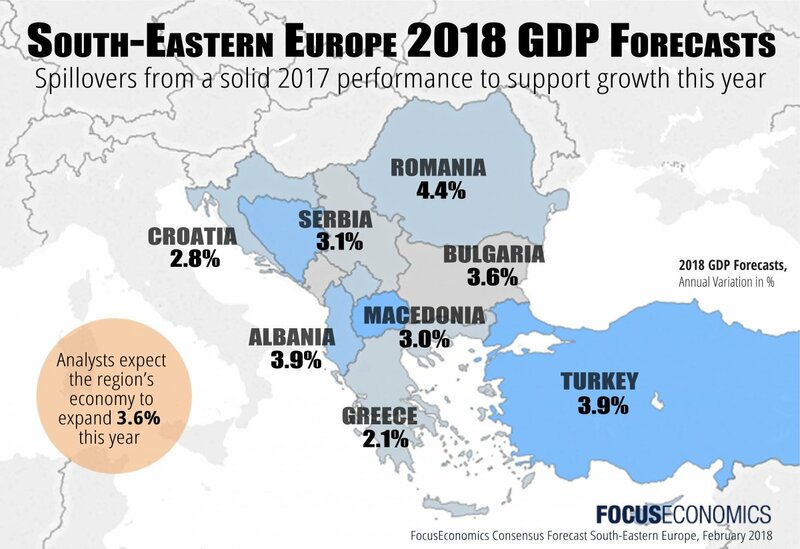 Four economies in the region, including major players Romania and Turkey, saw their forecasts upgraded, while the Bosnian, Cyprian and Macedonian economies all had their forecasts cut. The GDP forecasts for the remaining countries surveyed were unchanged. The economies of Romania and Kosovo are expected to grow at the fastest rates in the region this year, with expansions of 4.4% and 4.1%, respectively. Turkey, the region’s largest economy, is seen growing 3.9% this year. On the other end of the spectrum, Greece is expected to log the weakest expansion, at 2.1% growth. High-frequency indicators suggest economic momentum, while resilient, moderated in recent months. It was aided by robust domestic demand and a recovery in the external sector, but hampered by the government’s depleted fiscal stimulus. Economic conditions remained supportive of growth early this year, with the manufacturing PMI recording its highest figure in seven years in January, and both consumer and business sentiment shooting up in the same month. Nonetheless, the blistering pace of growth in 2017 came at the expense of a deterioration in the country’s external metrics: The 12-month rolling current account deficit widened to a three-year high in November, further exposing the country to shifts in investor appetite because of Turkey’s reliance on short-term inflows to finance its deficit. Economic growth will experience a soft landing this year as the government limits the extent of its fiscal stimulus and focuses on maintaining the economy on a steady course ahead of next year’s twin elections. In addition, a weak dollar and strong investor sentiment towards EM assets boosted inflows of foreign capital last year, but further tightening by the Fed this year and swings in global market sentiment continue to pose major threats to Turkey’s financial stability. The FocusEconomics panel expects growth of 3.9% this year, which is up 0.2 percentage points from last month’s estimate. It also expects growth of 3.8% in 2019. The economy appears to have lost some steam in the final quarter of the year. Growth in industrial production moderated in year-on-year terms in the first two months of Q4, and the unemployment rate edged up throughout the quarter, after declining in the first three quarters. Survey-based business and consumer confidence dipped in December as consumers’ assessments of current and future economic conditions deteriorated. 2018 started on a brighter note, however: In January, consumer confidence bounced back to November’s level, and business confidence jumped to the highest level since October 2008. On the political scene, Prime Minister Boyko Borisov survived a no-confidence vote on 25 January over the lack of progress in combatting widespread corruption. The opposition has criticized Borisov for not tackling corruption, which is weighing on foreign investment and stalling talks for greater integration and cooperation with the European Union. The Bulgarian economy is set to decelerate in the next two years but will remain buoyant nonetheless. Tighter fiscal spending and higher inflation will weigh on private consumption and overall growth. FocusEconomics Consensus Forecast panelists expect GDP to expand 3.6% in 2018, which is up 0.2 percentage points from last month’s forecast. For 2019, the panel sees growth moderating slightly, to 3.2%. Recent data suggests that economic activity cooled somewhat in the final quarter from the third one. In December, the unemployment rate increased for the third consecutive month, mainly due to seasonal factors, and the annual contraction in industrial production sharpened. However, retail sales expanded healthily throughout the quarter. On 12 January, Fitch Ratings upgraded Croatia’s credit rating from BB to BB+, citing the robust cyclical position and the improvement in public finances as reasons for the upgrade. In mid-January, the IMF concluded its annual Article VI consultation with Croatia. The Fund praised the country’s favorable fiscal performance and conservative prudential policies. However, it also stressed the need for the government to cut public sector wages and social benefits, as well as the need to liberalize the labor market, streamline public administration and privatize SOEs. Growth is projected to decelerate slightly this year, as the expansion in the tourism sector moderates, restraining private consumption growth. On the other hand, growth in fixed investment should speed up thanks to accommodative financing conditions and stronger EU fund inflows. Moreover, the government’s prudent fiscal stance will maintain the debt-to-GDP ratio on a downward trend. The main downside risks stem from the Agrokor restructuring process, which could hurt banks’ balance sheets and the company’s providers, weighing on credit growth and investment. FocusEconomics panelists project GDP growth of 2.8% in 2018, unchanged from last month, and 2.7% in 2019. In December, a strong base effect caused inflation to moderate in Turkey, putting an end to four consecutive months of strengthening price pressures in South-Eastern Europe. Regional inflation eased to 7.6% in December from November’s nine-year high of 8.3%. Although pass-through effects from a weakened lira will continue to exert pressure on Turkish consumer prices, warm weather early this year and a very strong base effect should see inflation trending lower until April, which will weigh on regional prices. Slightly tamer inflation in Turkey in December offset a fresh multi-year high in Romania, as well as faster inflation in Albania, Macedonia and Serbia. Conversely, five other countries saw softer inflation in December, while consumer prices decreased in Cyprus on an annual basis. Inflation in the region is expected to decelerate from 7.4% in 2017 to 6.1% in 2018. The estimate for this year was, however, revised up 0.1 percentage points because of stickier-than-expected inflationary pressures in Turkey and strengthening inflation in Romania. These more than offset downward revisions to the 2018 inflation outlook for Bosnia, Croatia and Greece. Inflation is expected to soften to 5.7% in 2019. Looking for forecasts related to in South-Eastern Europe ? Download a sample report now.